If you have a walking dead fan on your shopping list, you are in the right spot. I have found 25 Awesome gifts that they will love to receive! From apparel to fabric by the yard, this list has something for everyone! I think these are pretty fun ideas. I am loving the zombie slippers! I know a few guys who would adore the Zombie Apocolypse Survival Kit. No matter which gift you choose, your going to make someone really happy! 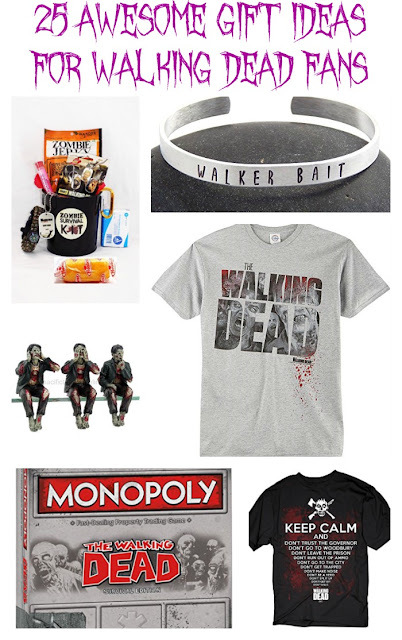 Which of these gift ideas do you think the Walking Dead fan on your list will love the most? I would love to hear if you have an idea for an unforgettable gift idea for the fans in my life!